NEWS ANALYSIS: The Norwegian Nobel Committee will be awarding this year’s Nobel Peace Prize next weekend, after having to put up with weeks of unprecedented political debate in Norway over how Parliament chooses committee members. 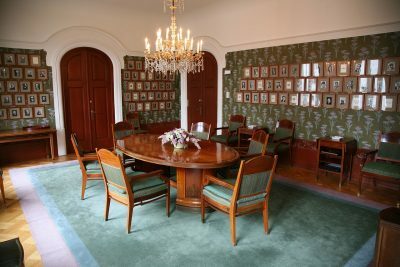 Now calls are going out that both the committee and its professional support apparatus at the Norwegian Nobel Institute deserve better, and that Nobel Committee members should no longer have strong ties to political parties themselves. The debate has been anything but peaceful or conciliatory. It was triggered by the conservative Progress Party’s hugely unpopular choice of the member it’s entitled to nominate, under the terms of the late Swedish industrialist Alfred Nobel’s will (external link). Nobel is the benefactor of all the Nobel Prizes set up to reward outstanding achievements in literature, sciences and the pursuit of peace. Current conflicts over how prize committees in both Sweden and Norway are set up to carry out his legacy are enough to leave Nobel spinning in his grave. In Sweden, the Nobel Prize for Literature is caught up in the worldwide “me-too” campaign against sexual harassment, while in Norway, debate has swirled for years over how members of the Norwegian Nobel Committee award the Nobel Peace Prize. Despite frequent controversy over its winners, the Peace Prize remains what many consider the most prestigious prize in the world. 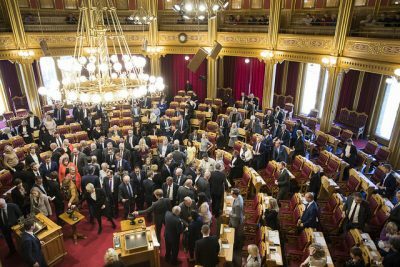 Now debate rages over how the Norwegian Parliament itself chooses members of the Norwegian Nobel Committee. Uncertainty swirls over its makeup just weeks before new permanent and substitute members are supposed to be in place for the launch of six-year terms from January 1. The debate hit the boiling point earlier this month when the conservative Progress Party nominated its former, now 73-year-old leader Carl I Hagen to replace another of its former politicians, Inger-Marie Ytterhorn, on the committee. Not only did Ytterhorn want to retain her seat, Hagen is also widely viewed as being one of Norway’s most controversial politicians during the past four decades. Many, including the former director of the Norwegian Nobel Institute Geir Lundestad, consider him “unsuited” for the committee because of Hagen’s track record of being highly critical of immigration, Islam, advocates of the environment, efforts to reverse climate change and human rights, and the taxes that finance Norway’s social welfare state. Many Members of Parliament, meanwhile, base their opposition to the Progress Party’s choice on the fact that Hagen, who served in Parliament for many years and disliked retirement, remains an active politican. He’s a member of the Oslo City Council and was elected this past September as a substitute Member of Parliament who can be called into service at any time. On Thursday, a majority of party leaders agreed, according to opposition leader Jonas Gahr Støre of the Labour Party, that Hagen is thus disqualified from serving as a member of the Nobel Committee. They stress how, since 1977, Parliament has avoided naming any current Members of Parliament to the committee in order to preserve its political independence. Repeated attempts to get the Progress Party to choose someone other than Hagen, however, have failed. Both the party and not least Hagen himself continue to ignore and dismiss all the criticism against him, not just from political opponents but also from the Nobel Institute’s current director, Olav Njølstad, and now nearly 40 professors at Norwegian universities who are all concerned about the committee’s political independence. Even ordinary citizens have joined the debate, with one man in the Oslo suburb of Bærum worrying in newspaper Aftenposten that an appointment of Hagen can harm the committee’s reputation abroad, because of how he has “threatened and quarreled his way” to a seat on a committee set up to internationally recognize peace. Hagen has also shown himself willing to defy Norway’s constitution by dumping the parliamentary position to which he was elected. Perhaps the most amazing aspect of the conflict that Hagen and the Progess Party have stirred up this fall is how Hagen doesn’t seem bothered by all the criticism and opposition to his Nobel Committee nomination. Even one of the Progress Party’s own MP’s has accused Hagen of “lacking respect” for voters, the Parliament and the committee, while Hagen himself has been called, in print, everything from “a barking underdog” to a “narcissist” with utter disregard for what “most folks” think. The Progress Party has, for years, billed itself as the party that champions the interests of folk flest (most folks). Nor does Hagen seem to care that he’s likely to be unwelcome on the committee itself, given Njølstad’s objections. As he flew off for another week of holiday in Spain in mid-November, Hagen brushed off suggestions that he’s so conceited that he puts his personal interests and desires first. Both he and his party continue to claim that with his years of political experience, he could contribute a lot to the committee’s work. An actual lack of firm rules for Nobel Committee nominations, and reliance instead on parliamentary precedent (what the Nobel Committee itself calls a “restriction” agreed upon in 1977) has left MPs on thin ice in their attempts to halt Hagen’s nomination. A history of former politicians winning seats on the committee further complicates matters. Two former elected officials (Thorbjørn Jagland of Labour and Ytterhorn of the Progress Party itself) sit on the current committee, for example. 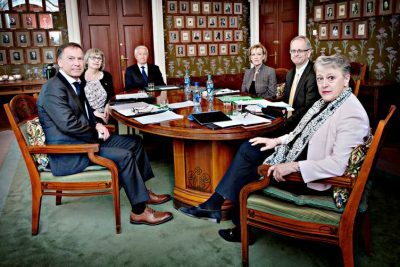 Both the Conservatives and the Center Party have also just nominated two of their own former politicians as new substitute (vara) members for the Nobel Committee: Kristin Clemet, a long-time MP and government minister for the Conservatives, and Anne Enger, a former leader of the Center Party and MP who led Norway’s anti-EU campaign in the 1990s. Enger, moreover, is due to immediately become a permanent member of the committee from January 1 because the Conservatives are ceding one of their seats, held by the late Kaci Kullmann Five, to the Center Party. That makes Enger’s appointment especially ironic, if not only for the fact that the Nobel Peace Prize was awarded to the EU just a few year ago. The EU may never have won the prize if Enger had been a committee member, given her political leanings. Jagland’s seat on the committee, meanwhile, is also disputed because not only is he a former Norwegian foreign minister and prime minister, he also heads the Council of Europe. That raises questions of conflicts of interest, for example over any Peace Prizes that might involve human rights conditions in member countries of the Council of Europe like Russia, Poland, Hungary, Azerbaijan or Turkey. 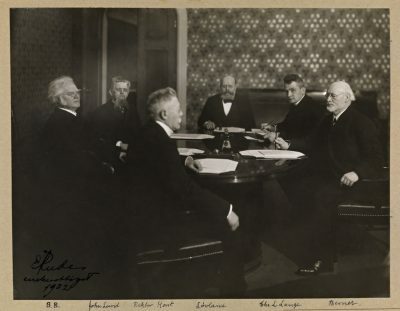 In the midst of all this, Njølstad and the current committee must prepare for their upcoming day in the international spotlight, when the Nobel Peace Prize will be awarded to the International Committee to Abolish Nuclear Weapons (ICAN) next Sunday on December 10, the anniversary of Alfred Nobel’s death. They’ve already had to deal with decisions by some ambassadors in Oslo not to attend the Nobel Peace Prize Ceremony, which is broadcast worldwide, because they represent countries that produce nuclear weapons. Njølstad and the committee have lots of work to do over the next week-and-a-half as they gear up to welcome prize winners, dignitaries and royals, rehearse speeches, organize the ceremony, host the Nobel Banquet and the Nobel Concert (also broadcast worldwide). In the background swirls all the uncertainty around committee seats, who will fill them next year and how the committee will function. Newspaper Aftenposten reported Friday that the small but powerful Center Party may wind up with a swing vote if Labour moves forward with a proposal that would prohibit either permanent or substitute MPs from sitting on the Nobel Committee. The party’s nomination of Enger hasn’t contributed to de-politicizing the committee, nor have the Conservatives, who share government power with Hagen’s Progress Party and who won’t support a rule change that could be grandfathered in, and thus block Hagen’s nomination. Center may end up being grateful that they won one of the Conservatives’ seats on the committee and thus vote against introduction of new rules now. There’s still a possibility Labour or another party will nominate a candidate of their own to oppose Hagen, but few want to set that precedent or suffer its potentially negative political consequences. The leader of the Christian Democrats has even proposed postponing the entire process and leaving the current Nobel Committee as it is until new rules or some other solution is found. An alternative, Knut Arild Hareide told Aftenposten, could be to let the Progress Party’s seat, currently held by Ytterhorn whose term is expiring, remain empty. “Then the first vara (substitute) would automatically be called on to fill it,” Hareide said. That would clear the way for the Conservatives’ new substitute member, Kristin Clemet, to take a seat around the table. Some decision will need to be made, at any rate, before Parliament recesses for the Christmas and New Year holidays.